And we wonder how despite their age the Celtics keep winning. They got the Big Three and more that may have something to do with. 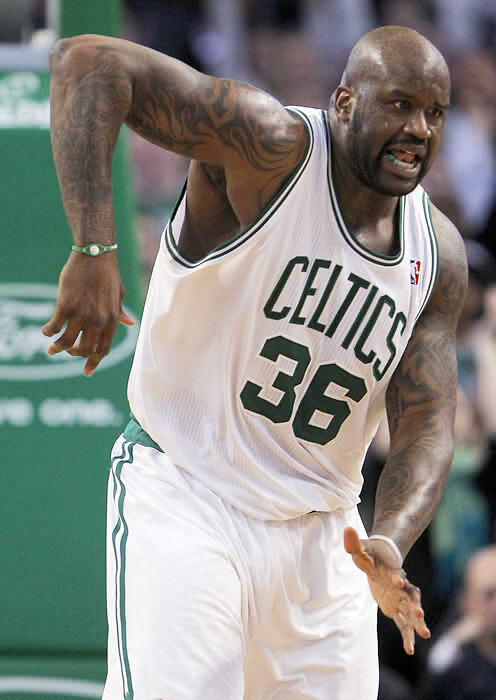 On a night when the Celtics were obviously off their game, Shaq stepped up big but the fun was only beginning. Never has a figure been able to give themselves as many nicknames in a career that have stuck than the "Diesel". After talking about the sluggish win over the Pistons (Rip Hamilton DNP-CD number 4 in a row) Shaq gave WEEI plenty of reasons from the sleet to the lack of finishing off opponents. Maybe a slip up on my spanish but doesn't that mean "the other two"? At any rate were glad he finally found something to drop for he and Rondo as they've been connecting well of late!